Thanks for an amazing June! Trending in the right direction! And they said we were too niche. SurfaceProArtist.com is four months young, but interest has been skyrocketing. 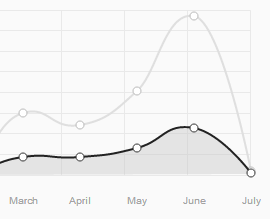 The just concluded month saw unique visits and page views triple over March. Thanks to all of you who have visited and particularly to those who've taken the time to leave comments on posts here and on our various social media accounts. It is hugely gratifying to know that real people are out there and learning or sharing knowledge about the Surface Pro and their favorite art programs. For July, I'm still debating whether to risk installing the Windows 8.1 preview. I don't want to risk losing the hard-won functionality I've achieved since I purchased my tablet. But that's what this blog is for, right? What do you think? Please leave a comment below. Later this month, my daughter and I will be attending Siggraph 2013 in Anaheim, CA. The premier computer graphics conference in the world, Siggraph is a tiny fraction of what it once was, but it's still a lot of fun and a great source for inspiration. Lastly, the gallery section of this site is very sad. We'd be happy to feature your work if you've got Surface Pro-made creations you'd like to share with our readers.